Take an Advent break and choose from more than 100 city hotels of all standards. No reservation fees. The market started back in the 17th century. 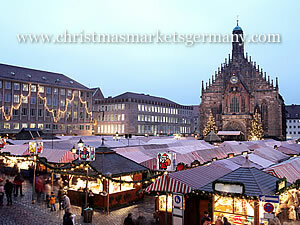 The first evidence of a Nuremberg Christkindlesmarkt comes from a wooden box with an inscription on the bottom which reads: 'Regina Susanna Harßdörfferin von der Jungfrau Susanna Eleonora Erbsin zum Kindles-Marck überschickt 1628' (essentially, 'received on the occasion of a Christkindl market in 1628'). The Christkindl is not directly related, as some assume, to the Baby Jesus (the 'Christ Child') but was a figure favoured by Luther and other leading figures of the Reformation (rather than the Catholic Saint Nicholas). The Christkindl is an ethereal blond being who brings presents to children who are good. Luther possibly intended a reference to the image of Jesus as a (very Germanic) baby. Ironically these days, in more Catholic areas the Christkind tends to be favoured, while in more Protestant or less religious areas, the Americanised version of St Nicholas (Santa Claus) is the one who brings presents. She must be a native Nuremberger (have been born there or lived there for a long time) and be between 16 - 19 years of age. She should be at least 160cm tall and free from vertigo! The six best candidates are elected for by residents and then the finalists appear in front of a jury before one is chosen. She is elected for two years and has to fulfil many official functions as well as give the Prologue which opens the market. Try a sausage. 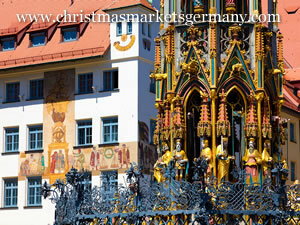 Nuremberg is famous in German-speaking countries for its sausages. Frankfurt has the Frankfurter and Vienna has the Wiener, but they tend to be more loved abroad. The herbier and smaller Nürnberger sausages (they have marjoram in them) are traditionally served in portions of at least six and generally with either potato salad or sauerkraut. They are served in restaurants and from grills all over the city. Visit the parade grounds outside the city. In the 1930s Nuremberg was promoted as the rally centre for the National Socialist Party and many of the images of thousands of supporters in the light of torches come from rallies held here. Nowadays the structures of the incomplete and grandiose architecture remain but the Documentation Centre can also be visited, which has a permanent exhibition 'Fascination and Terror' on the causes and consequences of this part of German history. Sample the history. Once Nuremberg was considered the unofficial capital of the Holy Roman Empire. Despite the destruction from wars through the centuries, there are still a wide range of historic buildings and museums to visit. Nuremberg Airport is not a major airport but it does have a good range of European flights. Air Berlin uses it as a hub. It is located about five kilometres to the north of the city centre and connected to it by the underground train service. Those flying in from other continents might find it more convenient to use Munich Airport, which has a wide range of flights all over the world. It is 160km to the south and connected to the main train network via the Munich regional train system. Nuremberg Hauptbahnhof is located just to the south of the historic centre and is an important rail junction for northern Bavaria. The city has a U-Bahn (underground trains) and tram and bus service and these are integrated into a common ticket service by VAG (Verkehrs-Aktiengesellschaft Nürnberg).